The 2015 Alpha Sigma Lambda Honorary Society members with RIT President Bill Destler. 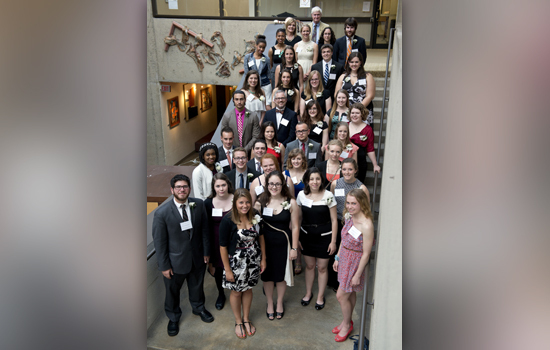 More than three dozen graduating Rochester Institute of Technology seniors were inducted into the Alpha Sigma Lambda Honorary Society on Monday night at a dinner hosted by RIT President Bill Destler. Students were able to invite a mentor, often an RIT faculty or staff member who helped them complete their degrees. Alpha Sigma Lambda was founded in 1964 to honor students who represent the guiding principles of ASL: Activities, Scholarship and Leadership. Recipients must be a senior in an undergraduate program and have at least a 3.4 cumulative GPA. Nominees are judged on the basis of scholarship, active participation and contributions in activities, and leadership in academic and co-curricular student activities. Service to the community is also considered. Rose Rustowicz, an imaging science major from Amherst, N.Y.
Juliana Shaw, a biochemistry major from Hilton, N.Y.
Sarah Wang, a biotechnology and molecular science major from Plattsburgh, N.Y.
Chelsea Weidman, a biochemistry major from Rochester, N.Y.
Jeta Aliu, an applied arts and sciences major from Prishtina, Kosovo. Blendrit Elezaj, an applied arts and sciences major from Prishtina, Kosovo. Ethan Ausburn, an electrical mechanical engineering technology major from Ocoee, Fla.
Rachael Dufford, a packaging science major from Glen Gardner, N.J.
Sara Mikulas, an environmental sustainability, health and safety major from Garden City, N.Y.
Kiana Richards, a packaging science major from Columbia, Md. Morgan Scoyne, an applied arts and sciences major from Drumbo, Ontario, Canada. Samantha Abraham, a chemical engineering student from Agawam, Mass. Caitlin Donovan, a chemical engineering major from Whitesboro, N.Y.
Daniel Miller, a mechanical engineering major from Schnecksville, Pa.
Claire Bernard, a new media interactive development major from Albany, Ga.
Emma Nelson, a software engineering student from Moline, Ill.
Ben Gordon, an industrial design major from Rochester, N.Y.
Sarah Ann Jump, a photojournalism major from Cordova, Md. Rachel Nicholson, a graphic design major from University Heights, Ohio. Nora Rogers, a film and animation major from South Burlington, Vt.
Yekaterina Satanina, a film and animation major from Hamden, Conn.
Paige Satterly, a visual media major from Robins, Iowa. Mariah Texidor, a professional photographic illustration major from Lodi, N.J.
Caitlin Williams, a biomedical photographic communications major from Moriah, N.Y.
Kyle Burke, a biomedical sciences major from Chelmsford, Mass. Kimberley Duru, a biomedical sciences major from Lagos, Nigeria. Daniel Malcaus, a nutrition management major from Rockaway Beach, N.Y.
Patrick McMullan, a biomedical sciences major from Easton, Pa.
Rebecca Nolan, a biomedical sciences major from Media, Pa.
Alyssa Ratajczak, a biomedical sciences major from Cheektowaga, N.Y.
Brandon Dziedzic, a psychology major from Sloan, N.Y.
William Gerken, a political science and journalism major from Williamsville, N.Y.
Zoe Gordon, a political science major from New York, N.Y.
Tessa Riley, a psychology major from Madison, N.J.
Alexandra Binnington, a finance major from Toronto, Ontario, Canada. Michael Hayes, a finance major from Hamburg, N.Y.
David Weinberger, a new media marketing, media arts and technology major from Havertown, Pa.